The information below was created for the 2012 Triple F, which occurred on February 25, 2012, with more than 45 fatbike racers taking to the 40-mile winter singletrack endurance challenge on fatbikes at Elm Creek’s newly established singletrack trail. If the event described below (recapped here at RideFatbikes.com) is of interest to you, be sure to keep tabs on what’s in store for next year’s Fatbike Frozen Forty (Triple F 2013). This is the official website of the Fatbike Frozen 40, so keep an eye on Frozen40.com (and RideFatbikes.com) for details about next year’s race. Fatbikes create obvious and immediate opportunity for fun rides and races on winter mountain bike singletrack. Many of the early events have catered to short-distance race formats or extremely long distance multi-day ultra-endurance formats. However, for those who are looking for a mid-distance endurance race (with the option of being a less intense race and more of a personal endurance challenge for those who don’t want to be at the front of the pack), there are few Minnesota events short of the Arrowhead 135, which is an ultra-endurance event that demands training, gear and fitness requirements that are daunting to many new or even veteran fatbikers. While I have great respect for Minnesota’s Arrowhead 135 and the multiple ultra-endurance races in Alaska (and the athletes that take up the challenge), a mid-distance endurance event creates opportunity to another group of athletes (or perhaps to the same group in a more relaxed and social format). With all that idea in mind, the Fatbike Frozen Forty (Triple F) was conceived. Ride Enterprises, LLC presents the first Triple F fatbike endurance event on February 25, 2012. This event combines several options: a 40-mile fatbike endurance race on singletrack trail is the focus, yet it offers riders the ability to ride 10, 20, 30, or 40 miles of singletrack at their own pace, welcoming fatbike riders of all abilities to challenge themselves as they see fit. It was designed to combine fatbike racing, with a casual and social environment for a fatbike gathering, with sponsors, food, and fun. This winter fatbike race is designed to have distance options for all abilities of fatbike riders, building goodwill in the fatbike community, and having a pile of fun in a month that is historically not the most exciting time to be in the frozen tundra of Minnesota. Registration on the date of the ride will be between 8am and 8:30, with the ride beginning at 9am (in stages, depending on registration numbers). At approximately 3pm the event will conclude. 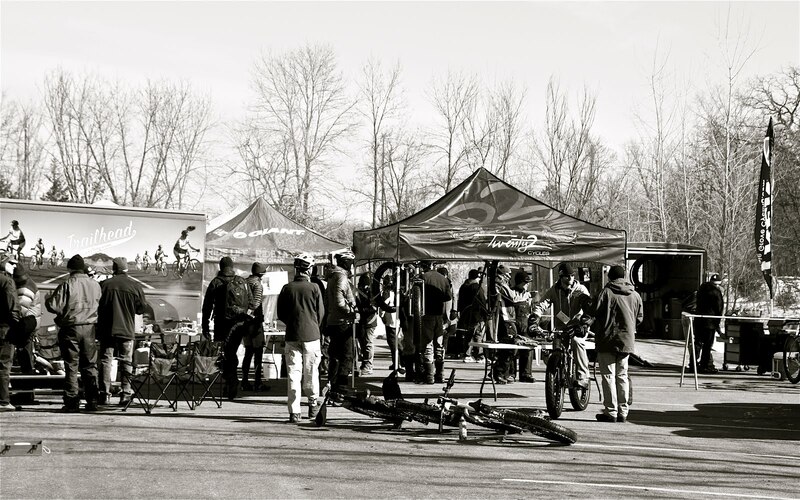 Sponsors are providing mechanical support, demo bikes, product give-aways and more. We’ll have food, beverages (including beer from sponsor Surly Beer), a heated warm-up tent, and possibly a grill-out. Registered riders will be eligible for some great fatbike gear and bike-related products like energy bars, handmade cycling caps, Bar Mitts, Husker Du tires, laser-etched mugs, and some cool swag. The 2012 Fatbike Frozen Forty (Triple F) will be held at Elm Creek Park in Maple Grove on February 25, 2012. Our primary spnosor and collaborator is Twenty2 Cycles (Twenty2Cycles.com) from Coloardo. Other sponsors include Cognition Caps, Bar Mitts, BraaapEnergy.com, XXCMag.com, Maple Grove Cycling, Trailhead Cycling, Adam Turman, PreRace.com, 45Nrth.com, Peace Coffee, and our newest sponsor Surly Brewing Co.! If you’d like a chance to get in on the ground floor of what is sure to be an awesome event, Contact Us. Sponsorship in various levels is still available, whether you wish to demo gear at the event, contribute financially, or donate prizes or swag for give-aways. This is intended to be mid-distance endurance event (40 miles on snow-covered single-track), to be ridden on fatbikes only (those bikes with 3.7 inch or larger tires F&R), in 4 laps of approximately 10 miles each. Choose to ride one lap, two laps or go for the full 40 miles or the King of the Triple F (most laps completed) – how far you push yourself, and how fast, is up to you. If we have no snow or the trail is closed, we’ll open up a paved trail route, and possibly break the event out to a race wave and a recreational wave. In the event several riders want to share a bike (or conserve energy) we have a “team” format (2-4 riders can share a fatbike, switching riders between laps). The title of “King of the Triple F” will be awarded to the rider who completes the most laps in 6 hours. Depending on how many teams register, we may also have a team winner for most miles/laps logged. At the end of the event, we plan to have a post-ride dinner/gathering at a local restaurant or bar. To sign up, please use our registration page at Prerace.com, here. If you’d like to ask a question, please contact us. If you don’t register, you won’t be eligible for the cool prizes, give-aways, and other fun stuff we’ve got planned, and you won’t be in the loop for announcements and last-minute emails, etc. Please register here today, so you don’t forget. No fatbike? Looking for a team? For those who do not have a fatbike and would like to be placed on a team with other riders (where each rider would complete one or more laps), please leave a comment below or contact us and we’ll try to pair you with someone who has a fatbike and is also looking for a team. If you have a fatbike and would like to team up with another rider who does not have a fatbike, please contact us to let us know so we can try to connect you with a teammate. Or look for fatbike rental information to be posted at the newly established FatbikeRental.com. Keep checking back at this site for final event details and announcements. We’ve got a map to the area and a trail map at our “Details” page, here. We’ll make trail maps available at registration as well. My name is Ben Witt, I own Milltown Cycles in Faribault MN. We specialized in fat bikes, and stock bikes from Salsa and Surly. We offer professional wheel building and custom fat bikes and regular bikes. You can check out our blog at http://www.milltowncycles.blogspot.com, our website (which is terrible and getting redone,) at http://www.milltowncycles.com and you can check us out on Facebook at http://www.facebook.com/MilltownCycles. I’m interested in talking to you about sponsoring the Frozen Forty, and being a sponsor of this site. Feel free to drop me an email at milltowncycles@gmail.com, or you can contact me by phone at 507-581-6198. Thank you for the opportunity to help promote fat bikes and fat biking in MN. I look forward to talking to you. Ben – I’m already familiar with Milltown Cycles, and have been meaning to make a visit to Faribault to check it out. Some of the builds you have featured on your blog are outstanding. It would be a great privilege to have Milltown Cycles as a sponsor of the Fatbike Frozen Forty. The ride is still in the early planning stages, so those who want to sponsor or ride can be directly involved in the planning of what could be a very cool local ride that will promote and build the fatbike community. I’ll send you an email to work on some details. In the meantime, thanks for your interest in the site and the ride. Do I understand you are also the architect of the Fat Tuesday fatbike rides? If so, kudos on that and maybe we can find a way to get some of the Fat Tuesday riders interested in the Triple F.
That race would work well for me. Me and the FatBack wait for the details. Dave – thanks for the support. The first run of the Fatbike Frozen Forty is going to be a trial run, to say the least. Those in on the ground floor will be able to say “I remember when…”. Consider yourself one of the early pioneers. I will try to announce a date and location by mid-October at the latest. This should be a great ride. Feel free to email to brad @ ride fatbikes Dot com if you need further follow-up, and I’ll add you to the list for sending out details.